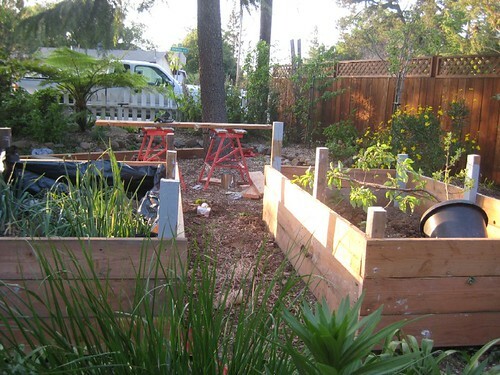 Here’s the entrance to the veggie garden – we built the two long beds on the far left and right. I went this week and finished up the planting. The kids were so into it – it was so great to see their enthusiasm. The little ones needed a bit of guidance (they were a bit rough with the plants ) but my opinion is “we can always replant”. It’s more about getting them interested and in the dirt. If we lose a few plants along the way, no big deal. As an adult sometimes it’s hard to let go of control and let your kids help out (it doesn’t always turn out the way you intended or it may take a little longer) but you just have to relinquish that control and let them be a part (especially if they are showing interest). I have my moments that I have trouble relinquishing that control but I try to be conscious of that when we are working on projects. In keeping with Earth Day and reusing items, we made bird feeders out of 1/2 gallon milk and juice cartons. They were so easy to make and there is nothing better than inviting our feathered friends into your environment. We just love to watch the birds feed on our feeders. I think the kids will get a big kick out of seeing the birds come to feed as well as enjoy filling the feeders. We’re going to make some for our house too – you can never have too many bird feeders. If you want to make one of your own follow this link – have fun! So I was thinking about different ways everyone can make Earth Day everyday and these are all very simple and easy ideas that don’t take much effort but are very beneficial to our environment. First and foremost we all must start REDUCING our consumption. It’s insane how “throw away” our society is. Just keep buying and using and buying again. With no thought about where these products come from, how the production of these products are affecting our enviornment and what’s going to happen to this product once it’s lifecycle ends. So the first thing to remember is you need to reduce your consumption. Some ways to reduce your consumption …. instead of buying new, buy used – there are great consignment stores, thrift stores, antique stores and garage sales. Also now with ebay and craigslist – it makes it even easier to buy used. Especially with kids – why buy new? it’s just going to get thrashed anyways or they will grow out of it before they even wear it more than once. By buying used you are keeping that item out of a landfill and also you are preventing more natural resources to be used to create another item. instead of plastic baggies for your kids lunches use reusable containers (BPA free). don’t buy bottled water- purchase a reusable water container (Sigg, Klean Kanteen, etc) and get the water out of your faucet (which has more stringent regulations than bottled water). Plus they have super cute designs for kids – it makes them more apt to use them. bring cloth bags when shopping. Keep a couple in each of your vehicles so they are always there. most garbage companies offer curbside recycling – take advantage. If your service makes you separate- keep a couple small containers in your house to make it easier. If you can combine all recyclables – well, there’s no excuse not to be recycling. Get the kids involved. My 4 1/2 year old loves to differentiate what goes in the garbage and what goes in the recycling. These are all just a few easy things that we do and that are easy for you to incorporate into your daily lives. It’s simple and it feels good to know you are doing something to help keep our planet green and it is a great lesson to teach our children. Our children are going to be born knowing the 3 R’s. It will just be a part of their life – there will be no question about whether they should or shouldn’t, it will be a given. I hope you and your families can find a way to make every day Earth Day! Happy Earth Day! Today is the one day a year EVERYONE thinks about Mother Earth. In our house “everyday is earth day”. I know that sounds so cheesy but it’s the truth. Everything we do, everything we eat, everything we buy, every decision we make we think about how that will affect our environment. It’s not forced, it’s just who and how we are. So for this earth day I wanted to share our passion about the Grand Dame herself, and we decided to spearhead Earth Day at Ryder’s school. We had been wanting to put in a drip system for the garden and for their flower area – the teachers have so much on their minds with caring for our children that we figured if they didn’t have to worry about watering the plants everyday it would be helpful and it would help the plants survive. 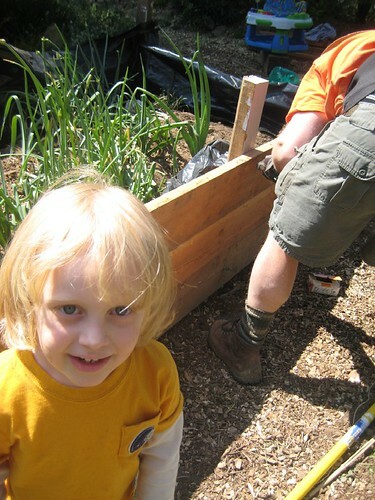 I think it’s such a wonderful experience for children to have gardens in their environment. It is so important for them to see where their food comes from. Ryder learns about gardening at our house, but I really like the idea of him having this at his school as well and I wanted the other children to learn about the benefits of growing your own food and the sense of accomplishment. This is a great way to teach healthy eating habits – without forcing it down their throats (literally). So we sent out an email asking for volunteers and we had such a wonderful response from the other families. It was a lot of hard work but it was all worth it. A couple of the parents said they were very grateful to be learning about running drip irrigation and about the different plants and techniques that we were using. This made me so happy to know that they would be bringing this knowledge home to their families. THIS is what it’s about. Lots of weeding and working the soil before we could have fun with the plants. We planted a lot of California Native Plants – to teach about using native plants and drought tolerant plants. We are trying upside down tomatoes. This is my first time doing it – so we’ll see how it goes – I have read a lot of great things about growing tomatoes this way and I thought the kids would get a kick out of this as well. It was a scorching hot day, but we all pulled together and worked hard and had fun. The kids were really into helping too. Earth Day isn’t only about doing things for the earth – it’s about coming together as a community and building a better community. If you care about the community and feel like a part of the community you will be more apt to keeping that community clean and really care about it. It was such a wonderful day – I can’t wait for next year – I have sooooo many ideas! What are you doing to honor Mother Earth? What kind of community activities where you and your family involved in? I would love to hear about other Earth Day festivities. So I hope everyone is doing something positive for Mother Earth this year. Actually I hope you are always doing something positive for her! But at minimum, at least on Earth Day. This year we are building new planter beds in our front yard (it’s been a long time coming- we’ve been saying we’ve needed new ones since the day we moved in) So almost 5 years later and many remodeling projects later we are starting on this one. We went to the central landfill and purchased reused lumber. What a deal! $0.28/ft. and it was used for framing so it was totally perfect (minus the nails that had to be pulled) but it’s awesome- we are reusing wood that would normally have ended up being burned or left at the landfill or who knows what else and we didn’t have to buy new. The central landfill is amazing. They have everything so dialed in, all the wood is separated in piles by type (redwood, doug fir, etc.) size (2×4, 4×4, etc) then they have piles of compost, mulch, cords of fire wood, etc – and I haven’t even mentioned the reuse area that has kids toys, bikes, doors, windows, etc, etc, etc,. Up at the site we purchased the wood there is a big sign that says they have diverted over 1 million TONS of yard waste from going to the landfill! If only all cities did this! 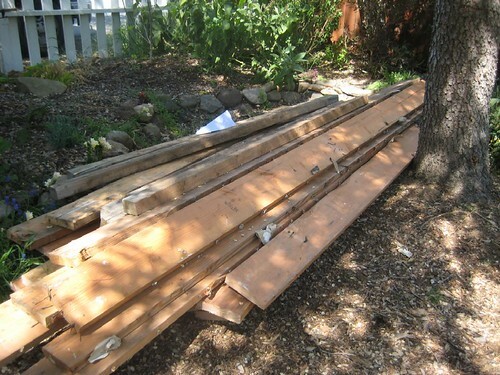 So, after a trip to the landfill, a day of pulling nails, we were ready to build. We are so thrilled with the beds, they still need the lip added (somewhere to sit or put our garden shovel) and we need to cut down the 4×4 to make it level with the top of the box. But we are pretty much there- one more day and we’ll be ready to get our veggies in. We had to take a break from it and go to the Earth Day celebration in Golden Gate Park. Bobby and Mickey from the Dead were playing along with Yonder Mountain String Band. It was a gorgeous day and good tunes carried in the breeze. Just getting our hands in the dirt and nourishing the soil was our minor contribution to our Earth. We will continue to nourish her throughout the year as we tend to our veggies and fruit. We want to pass this on to our children. 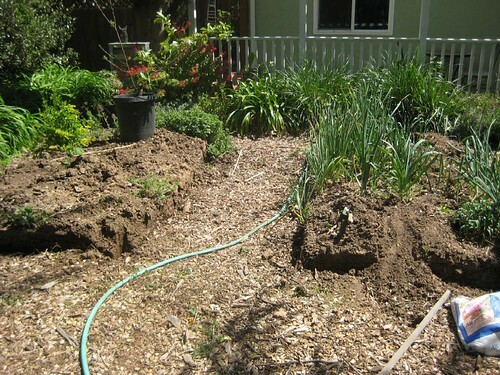 By creating a habitat for the bees, birds, butterflies, worms, etc. we are showing our children respect for all living beings and respect for the earth and for themselves. We will reap the rewards when we are picking fresh strawberries off the vine, fresh tomato and lettuce for sandwiches, fruit for lunch and more. So what are your plans for Earth Day? If you don’t have any- think about going out and buying yourself a Sigg water bottle or Klean Kanteen (stainless steel water bottles) and vow to not buy bottled water and bring your own water wherever you go. This one simple step can reduce the amount of plastic that is produced and that is sent to the landfills everyday (you know that plastic is made from oil) so this also helps in our reliance on oil. Another thing you can do is vow to bring your own bag to the grocery store- another very simple thing you can do but again it helps reduce our reliance on oil (no more plastic bags). They are making it so easy and cheap- most stores carry reusable bags that you can purchase for $0.99- keep a couple in your car at all times so you don’t even have to remember to bring them- they will always be there for you. So happy Earth Day to you- go spread the good word!!! !